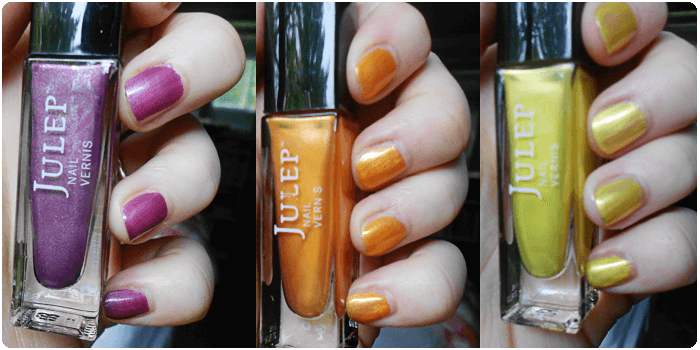 If you love getting to try out new nail polishes then I suggest you sign up for Julep’s Maven Program! I’ve been getting the boxes for a few months now ($19.99 a month) and have found that I love their polishes and hand products! I’ve also gotten full size hand care and nail care products and samples of other hand/nail care products. Their roller-ball cuticle oil is my favorite! I have 3 bottles of it! I thought I would just do a quick post on what I got for this month’s box and by all means if you’re interested go and sign up! 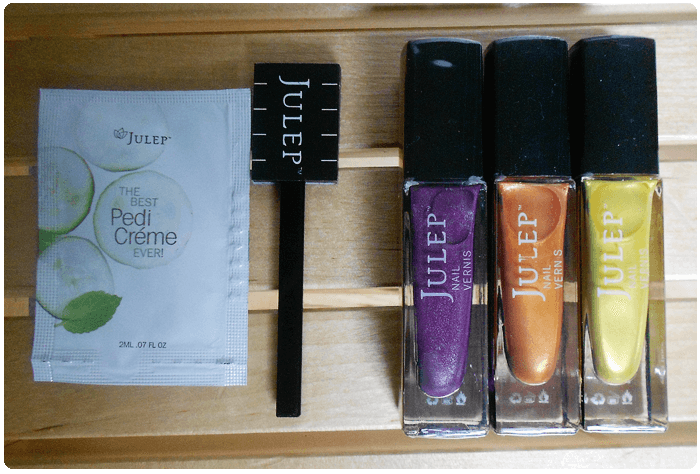 I would love it if you did it via my affiliate link: Julep Maven because I can then earn rewards. I’m all about reward systems! Once you become a Julep Maven, you get a personalized 20% code that you can use on any/all of your Julep purchases. So this is what I got in May’s “It Girl” box! All of the polishes had great formulas and I loved with Kylie that it’s a great polish even without the magnetic affect, however that being said, the magnet for me was super weak and really didn’t do much even after holding it close for over 30 seconds! I’ve had better results with my other magnetic polishes in 5-10 seconds, with super bold magnetic patterns. Also, the brush that came with Ashely was all sorts of messed up, made applying the polish almost impossible and the end result looked tacky, even though the polish itself is a fantastic color. For the month of May, by using my referral link, you can use the code MAYINTRO to get your first box for a PENNY! If you have any questions about any of the products or anything really, let me know! *all photos shot super quickly on my point and shoot! That’s too bad about the Ashley brush because that is absolutely my favourite color of the three! It’s gorgeous! I was going to so say “You should open a little ‘from home” manicure shop,” but the idea of other people’s fingers being in my nail polish kinda makes me cringe, lol. LOL I don’t want to share my polish either! I also LOVE the color but the brush is just impossible to use! Gorgeous! I am so addicted to nail polishes lately! Oh geez, I feel like I’m beyond addiction now LOL it’s a way of life! You know, those look great- but more than that, they look great with your skin tone! As a fair-skinned girl myself, I really don’t care for nail polish, one of the reasons being that it so often just looks tacky with my coloring, but this month’s kit you received is very pretty. I’d love to see them used together for nail art. Thank you! LOL I don’t see myself as pale very often but then I’ll venture out into public and always gets comments on how “fair” I am and how I am “ivory” or “porcelain”. I don’t think I’m THAT pale though! I have NO skill with nail art but I’d LOVE to see what you’d be able to do! Hey, that’s how the brush for my Kylie turned out! It was very awkward painting with it. But I managed. Do you have photos somewhere with the other magnetic polishes that you had better results with? I’m curious! Not yet but next time I use them I’ll take some photos!! 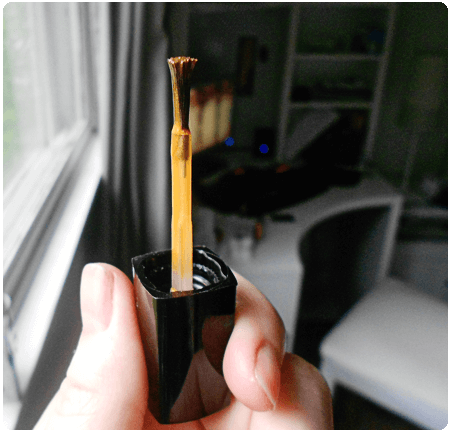 The brush that came with my Ashley nail polish was also messed up and, like you, it made applying difficult and messy. I’m bummed about this because I was really excited for the bright orange color. I mean I could take another brush, get ALL the polish off of it and then use it and then clean it again… but I don’t have the effort for that. I wish they would “fix” it somehow with either a free month or at the very least some sort of special bonus. I switched my Boho Glam box to the It Girl box and I am so excited for the colors! I also added on Sarah ) so I’ll have tons of pretty, summery colors! I’d definitely contact them and ask for a replacement. When I tried to do the add-on’s this month, their website was all sorts of jacked up and when I FINALLY got it to work? My box had already been shipped. A bit disappointing for sure. I am going to contact them about a replacement and perhaps the add-on polishes I wasn’t able to access as well. Did you order the mystery box this month? I do almost every time and every time I feel sad that I don’t get the uber box lol! I am curious about their pedi products! I may have to put some money aside and buy some with my discount (yay for us mavens lol!). I haven’t tried them yet, but they look like my feet should feel amazing after I’m done with them. lol! LOL!!! Well I can’t wait to hear if you like them! Definitely contact Julep about that dodgy brush. I’ve heard they send replacements when that happens, which could definitely be worthwhile, as the colour is so lovely. You wouldn’t want that to take away from the lovely polish. 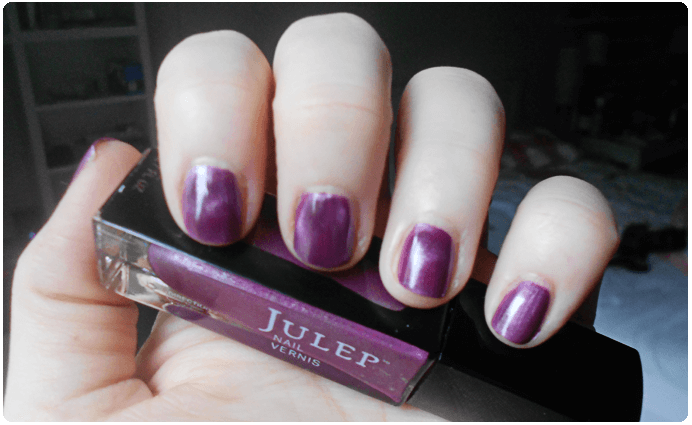 Either way, sitting here with immense jealousy because dear god I do want Julep in my life.